Five score and four years ago, a butcher named Benoit Matray opened a Paris bistro that bore his name (above) and the promise, "At Benoit, food and drink just like at home," which was quite a compliment to the bourgeois mamans of the fin de siècle. Later on, the words changed to "At Benoit you eat like a king!" 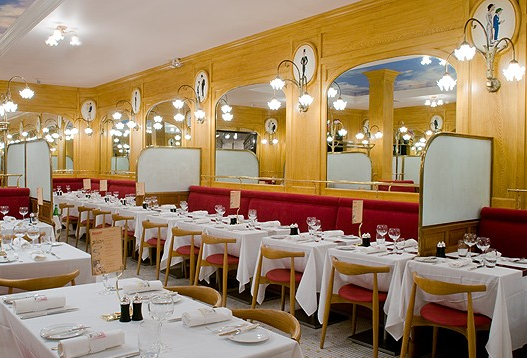 suggesting that this quintessential bistro, with its carved wood, copper bar, tiles, red banquettes and engraved glass went up-market--even more so after Alain Ducasse bought the place in 2005 from the third generation of the Matray family. Today, as you enter the New York Benoit, through a revolving door, to your left is a handsome, jaunty, very popular little bar, both before and after theater, serving a light menu and an array of aperitifs. The large main dining room is done up in golden-blond wood, tile floors, wall scones, bright tablecloths, and big mirrors, with enchanting trompe l'œil cloudy blue sky above you. The good lighting allows you to see everyone in the room--neighborhood regulars, theater people and theater-goers, and real live visitors from France, as are many of Benoit's staff. 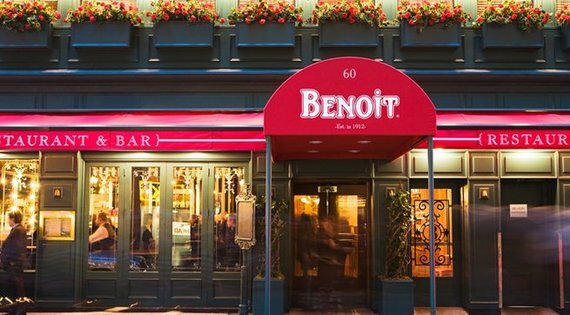 I've been to Benoit often as it's evolved, but my most recent visit was preceded a few weeks prior by one during which just about everything, from greeting to service to food, was so lackluster that I thought either the chef had changed or the staff was on the last week of their work visas. It was with real relief, then, that I returned two weeks ago to find everything as it was at its best. Perhaps buoyed by a very favorable NY Times review, the staff, now under Guillem Kerambrun (who also oversees the beverage program), displayed a buoyant French ésprit and the food overall had returned to good form. I was, of course, happy to see Philippe Bertineau still the chef, after stints at the Hôtel du Palais in Biarritz, Restaurant Lucien Vanel in Toulouse, Restaurant Daniel in NYC, Payard Pâtisserie & Bistro, and, most recently, at Balthazar. The menu toes the sacrosanct Parisian line, starting off with hors d'oeuvres like good and garlicky cod brandade; rich and creamy pork rillettes; and a crisp, fatty pied de cochon with tartar sauce, and more. 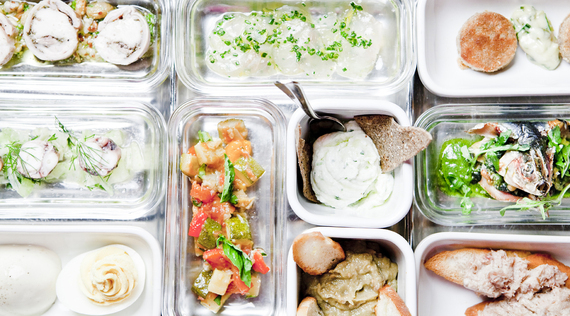 A choice of three ($14) makes for a good starter, five ($19) just enough to be shared by two people. 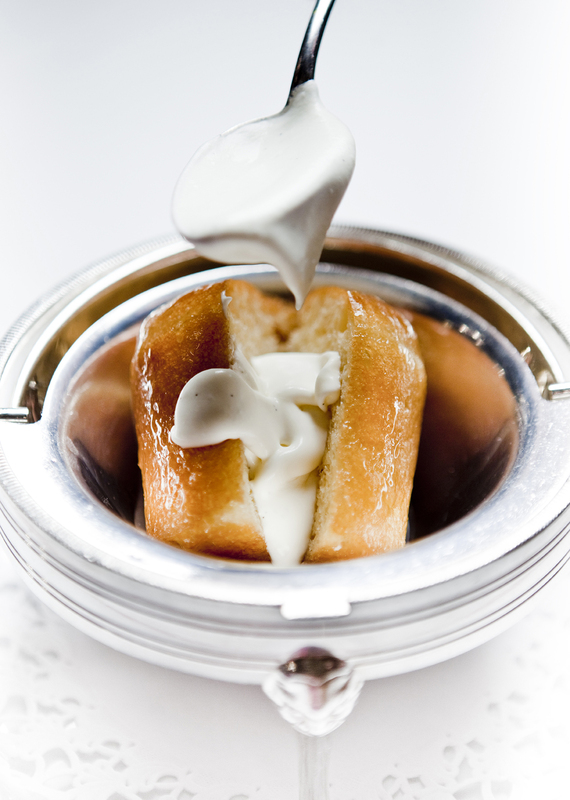 But first there is the lagniappe of puffy gougères, hot and riddled with Gruyère cheese, along with excellent bread and butter; brioche toast comes with a starter of duck foie gras terrine with rhubarb chutney ($28). And don't fail to order the Alsatian tart flambé lavished with abundant sweet onions and smoky morsels of bacon. It's absurd to think Bertineau would craft anything but a textbook perfect onion soupe gratinée ($14) or delicious fat escargots swimming in a garlic-parsley butter ($14). Odd then that an expensive (at $29) cookpot of lobster with spelt, chestnut, wild mushrooms and baby kale could be so lackluster, the lobster overcooked on two occasions, the sauce bland. Main courses have been winnowed to a basic ten items, as in Paris, with daily specials. One of the consistent favorites here, from the old La Côte Basque--once removed from Benoit's menu then put back after people clamored for it--are the quenelles of pureed pike with an exceptionally rich, silky Nantua sauce on fluffy rice pilaf ($28). Of course, there is roast chicken, now available for one ($27) or two ($52), all very succulent and buttery and perfumed with rosemary, though the skin was somewhat flaccid that night, served with a haystack of piping hot, thin French fries (which you should order whatever else you opt for). Cassoulet ($34) was hearty enough, but should have had a better, crackling crust. The bistro staple of filet mignon was of very generous size, perfectly cooked outside and in and ennobled with the classic peppercorn sauce ($46) that makes this less-fatty cut so much more flavorful. The special of the evening was tender white halibut, napped in a citrus-flavored reduction. Perhaps it is an affectation, but among the desserts I would have enjoyed having the finely grained baba, laced with excellent Armagnac and whipped cream ($12), lit on fire--it's fun and doesn't hurt the dessert--but Jean-LoupTeterl's chocolate soufflé with vanilla ice cream ($12) could not have been better, and the very fragile vanilla millefeuille ($12) is possibly the best in NYC and would compete well with any in Paris. Benoit's wine list is far more extensive than most bistros even think of having, and there are some good bottles under $50. By the way, every Tuesday this month offers Le Cochon ($39), slow-roasted suckling pig, which is so popular it's wise to call in advance. 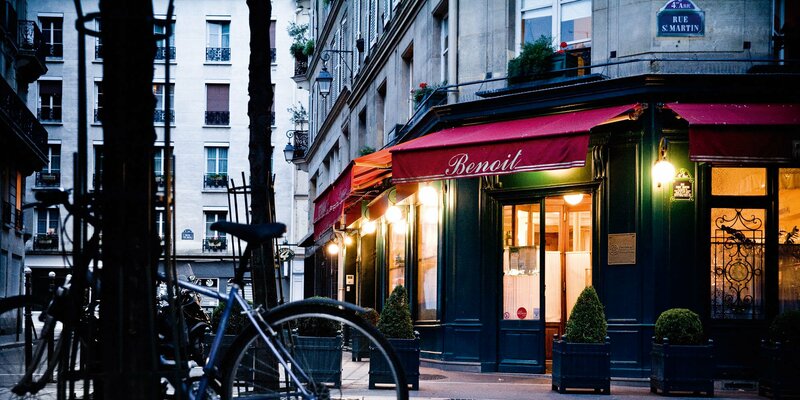 So I was made happy again by my return visit, and I realized that so much of the appeal of Benoit is its surroundings and its élan, the kind of place that at its best reminds you of everything there is to love about French bistros and everything you come to expect in a city where the best is always available. And I hope the entire staff keeps their Green Cards and stays put here forever. 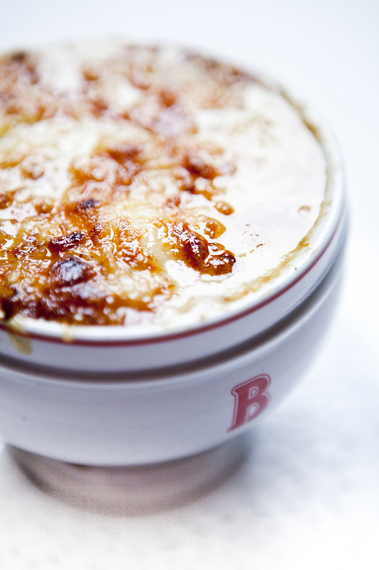 Benoit is open daily for lunch and dinner. A la carte, but with special prix fixe lunch and dinner. Photos of Benoit NY by Pierre Monetta.